Dolly, the main character of the series, introduces readers to several Dewdrop Fairies. The young girl explains that her family’s garden expanded during the war and that her older brothers, captains in the United States School Garden Army, considered maintaining the garden part of their duty. In the series, different Dewdrop Fairies teach how and when to plant vegetables based on their unique needs, as well as how to use fertilizer to help plants grow. Dolly learns that if seeds are planted too deep or not deep enough, they won’t grow, and there won’t be enough food to send to children in France who do not have access to fresh fruits and vegetables because of the war. The Dewdrop Fairies also reminded that readers could join the 3,000,000 soldiers in the School Garden Army just by asking their teacher. 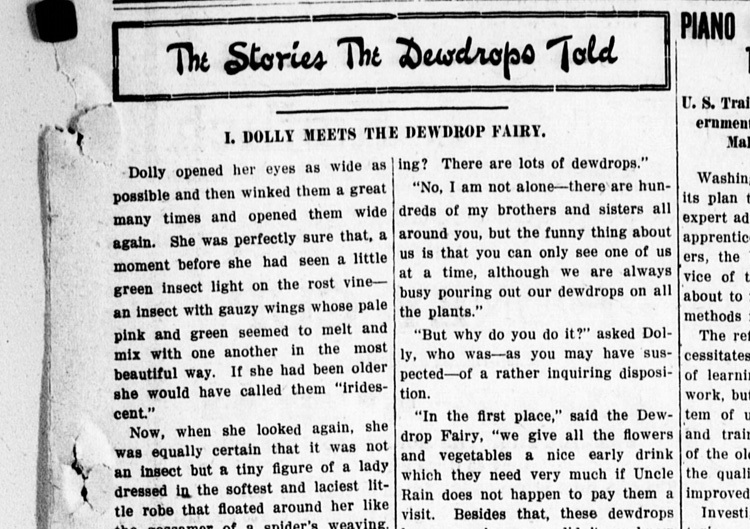 This installment of “The Stories the Dewdrops Told” appeared in the “Public Ledger” of Maysville, Kentucky, on June 20, 1919. Courtesy of Library of Congress. 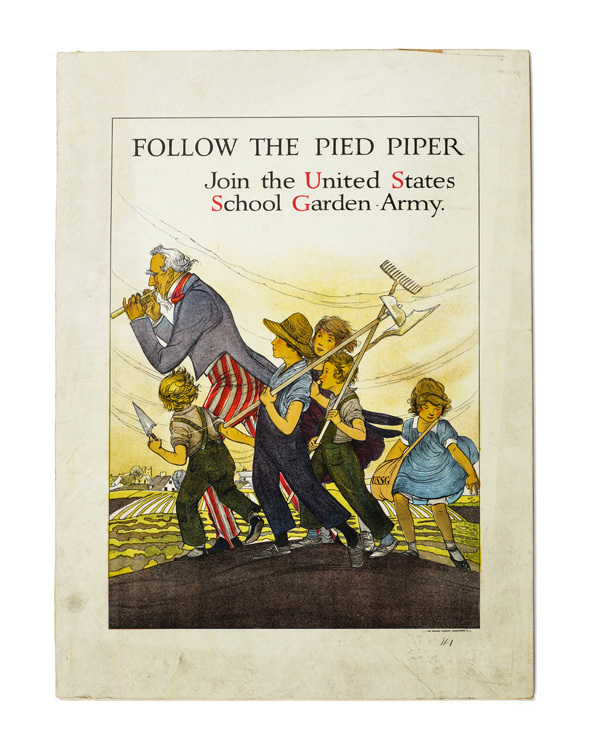 Children who grew up working in the School Garden Army used their knowledge to create the victory gardens of World War II. To support this new war effort, they created sustainable backyard gardens. However, postwar inventions and technologies made different foods more accessible. Refrigerators, freezers, and new methods of transportation changed how we acquired and used food. As we purchased more and more of our food at grocery stores, backyard gardens once filled with tomatoes and squash faded to weed-filled grass. 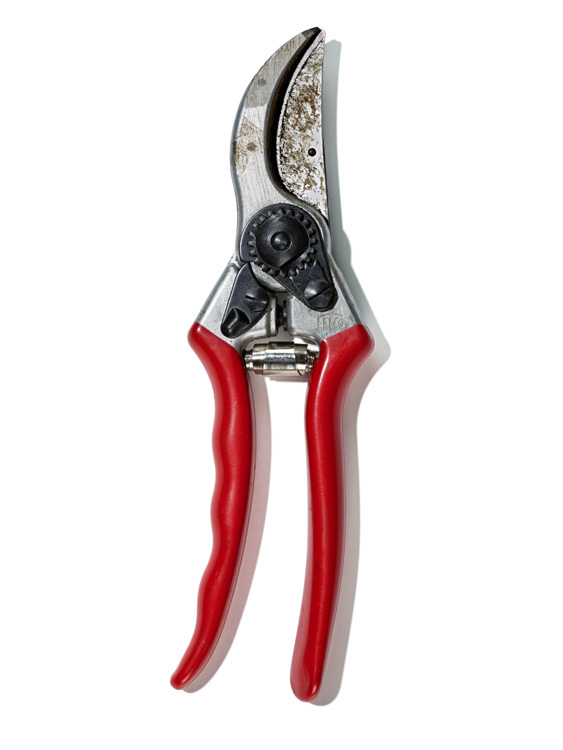 Parents and children alike spent less and less time gardening, as fresh fruits and vegetables were easily accessible. Collectively, we are becoming more aware of sustainable farming, we are creating gardens in our backyards again, and we are composting food scraps rather than tossing them in the trash can. In 1995 Alice Waters, an American chef and restaurateur, created the Edible Schoolyard program at Martin Luther King Middle School in Berkeley, California. Its concept was to change the way students think about food. On a one-acre plot, students grow, harvest, and prepare foods from their garden. While the work at the Edible Schoolyard program and Former First Lady Michelle Obama’s organic garden at the White House were not a collaboration, they both worked to achieve similar goals—to promote healthy eating habits in children. In 2009, along with 25 students from Bancroft Elementary in Washington, D.C., Michelle Obama planted the first vegetable garden at the White House since Eleanor Roosevelt’s victory garden of the 1940s. Like most first-time gardeners, the First Lady and students experienced some trials and tribulations. For example, they discovered that some of the plants placed next to each other were not companion plants—a lesson Dolly had learned from the Dewdrop Fairies. Like Dolly, they learned about “imps,” unwanted pests and weeds that grow in gardens. Perhaps the Dewdrop Fairies visited the White House garden and shared important information with Mrs. Obama and the schoolchildren to help their garden grow! Although not shared through newspaper articles and propaganda posters, the message of the Dewdrop Fairies is returning to suburban backyard gardens and Edible Schoolyard programs now operating in 53 states and territories. The Dewdrop Fairies’ legacy lives on as another generation of children learns the joys of gardening: the sheer delight of seeing a seed transform into a plant that will produce enough food to enjoy and share with neighbors throughout the season. Sara Murphy is a museum specialist and collections manager in the Division of Political History. She has previously blogged about how first families have memorialized and mourned as well as the process of exhibition installation.